We've all googled wine at some point, right? Perhaps we've searched for answers to questions we're a bit embarrassed to ask. Like, why does champagne fizz or why does chianti come in a basket? Well, my friends, it seems our secret Google habits have finally been exposed. 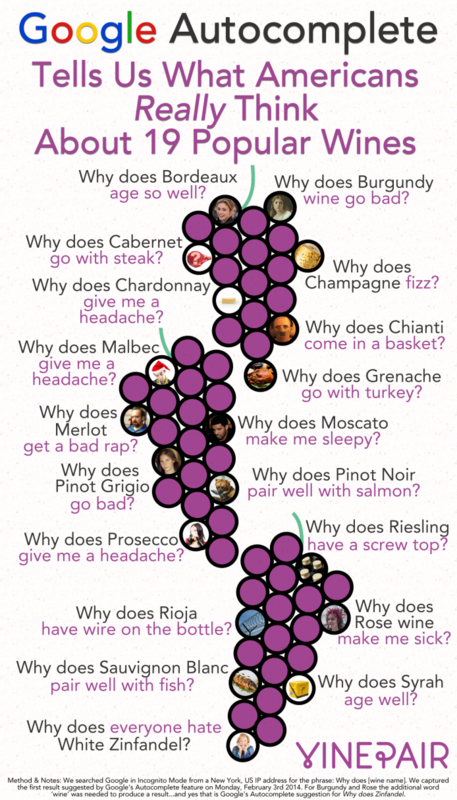 The folks at VinePair decided to have a little fun and research the top Google autocomplete questions Americans have about wine. The results are pretty revealing - and even hilarious - as you'll see in the nifty infographic below. Aptly titled Google Autocomplete Tells Us What Americans Really Think About 19 Popular Wines, the visual guide is a gem when it comes to market research. Questions ranged from common food pairing tips to interesting questions about why some wines cause headaches. We laughed out loud when we read some of the questions and you will too. Here's our favorite: why does everyone hate white zinfandel? LOL!